There are two basic types of pho -- beef or chicken -- as well as dozens if not hundreds of variations. Both pho bo, the traditional beef noodle soup, and pho ga, the version with chicken, are made with flat rice noodles and scallions. Then the games begin. For example, eight types of beef can be used in pho bo. Six vegetable and three condiment options add to the number of variations. 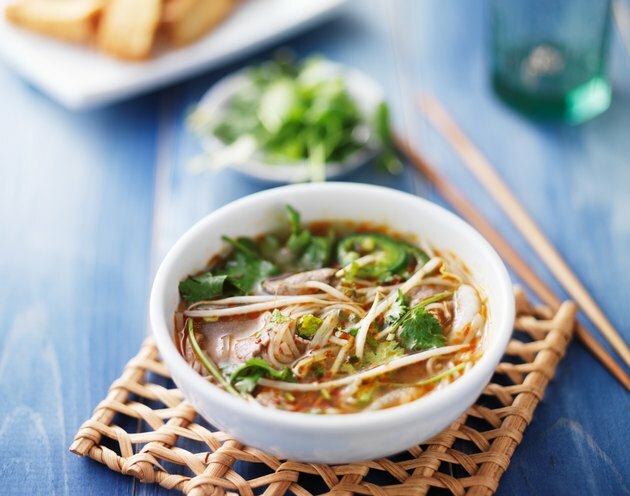 The word pho reputedly comes from the French term pot au feu, which means French soup. According to the Pho Fever website, pho originated in North Vietnam in the 1880s. It was influenced by Chinese and French cooking -- rice noodles and spices were imported from China and red meat was popular in France. After Vietnam was divided in 1954, the popularity of pho spread from North to South Vietnam, but the styles diverged. The northern version was simple, using fewer ingredients and cuts of meat. The southern version was more complex, with as many as a dozen ingredients. When Vietnamese refugees began immigrating to the U.S. in the 1970s, pho became popular in America. There are a reported 2,000 or so Vietnamese restaurants in the U.S., mostly cooking southern-style pho. With a couple of exceptions, the beef used in pho bo soup is medium rare, and it continues to cook in the soup broth. Your beef choices are bo chin, which is sliced well-done steak; bo tai, sliced rare steak; nam, flank steak; ve don, crunchy flank steak; gau, fatty brisket; gan, tendon; sach, tripe; and bo vien, beef meatballs, usually with tendon. Pho with chicken is a relatively simple affair, with chicken added to the broth. Vegetable choices for either pho bo or pho ga include basil, sawgrass, bean sprouts, scallions, cilantro and chili. Condiments for both soups include lime, chili sauce and hoisin, also known as plum sauce. The Loving Pho website simplifies the myriad pho options -- it advises you to "just tell them what you want." A good pho restaurant should be able to oblige you. Among the many ways to customize your pho, you can ask for fatty instead of the standard nonfatty broth, more or less noodles, and fatty broth with blanched onions on the side. You can get raw bo tai as a side dish to be dipped into your broth or side dishes of steamed bean sprouts. If you order the regular nonfatty broth, and you can see to the bottom of the bowl, it's a sign of high-quality pho.